21st century first world living is full of comfort and conveniences. Electricity. Indoor plumbing. Free public education. But it is easy to feel overwhelmed, and news headlines are overwhelmingly negative. 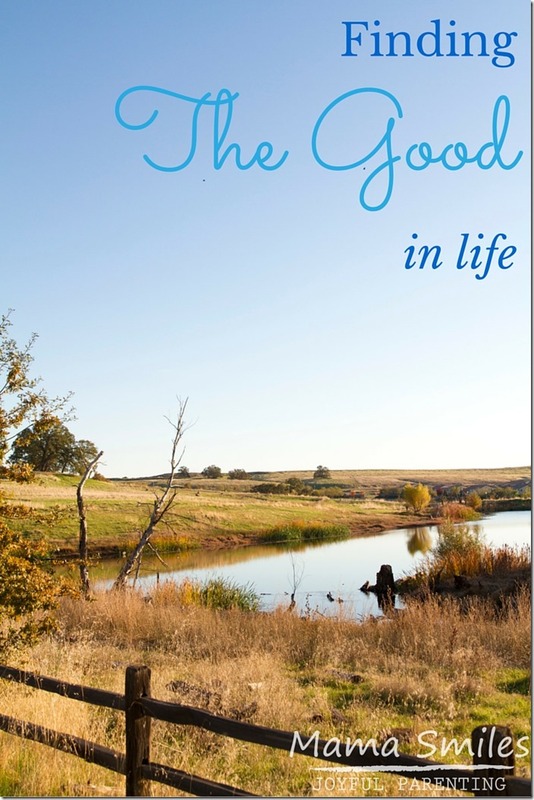 How do you find the good in life? How Do You Find the Good in Life? I have kept a journal for most of my life, and have written every single day for over a decade now. Although I do record setbacks and lessons learned, I find that journaling helps me be mindful of my everyday life. That focus helps me see the good things that happen. I have a small book where I write down things I am grateful for. Many of the things on the list are very simple: smiles, trees, green grass, rainbows, my kids, sewing, indoor plumbing (I really love that one), my washing machine… When I feel really down, tI make myself sit down and find something new to write in this book – and it has to be something I haven’t written down before. That rule forces me to think (good for engaging the thinking brain instead of giving in entirely to the emotional brain). It also means that I have to read through the list – reminding myself of all that I have. Laughter is an amazing medicine! Laughing helps us release relax, reducing anxiety and stress. Find an inspirational book, video, or song. Then read, watch, and listen. I find it much easier to focus on the positives when I am surrounded by nature. It makes the world a better place – creating instant good-ness in life. Smiling actually makes you feel happier! How do you find the joy in life? I’m so impressed with your journaling habits, and I like your tip for not letting emotions take over. They are so fickle! Sometimes I have to drag my emotions along with my will, but that is so much better than being ruled by how I feel that moment. I find that having little people, particularly babies, around reminds me of what is really essential (and often quite humorous), and helps me focus on others rather than getting totally wrapped up in what I want/need/feel. Showing love to others is truly life-giving! I always attempt to create journals and the like, but I never keep them up, primarily because I’d try handwriting them and I rather dislike handwriting materials.